It’s not uncommon for people to think that excellent cancer care is found strictly in larger cities, but that perception was recently disproved by Sussex County’s Sparta Cancer Center. The experienced team is one of only two Centers in New Jersey to earn the prestigious APEx award. Sparta Cancer Center has demonstrated compliance with the stringent standards of the American Society for Radiation Oncology (ASTRO) Accreditation Program for Excellence (APEx®), for a four-year accreditation of their radiation oncology services. APEx is an independent radiation oncology practice accreditation program developed by ASTRO based on a comprehensive set of sixteen evidence-based standards of radiation oncology practice. The sixteen standards are focused on five pillars of patient care: 1) the process of care; 2) the radiation oncology team; 3) safety; 4) quality management; and 5) patient-centered care. Accreditation through APEx is a rigorous, voluntary, multi-step process that can take up to one year to complete. 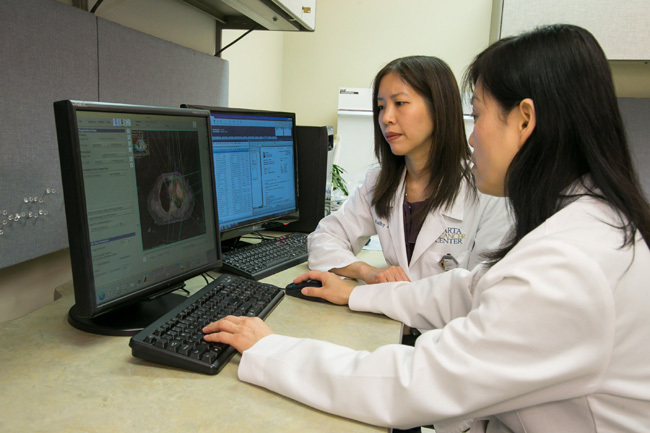 Each center seeking APEx accreditation must have its policies and procedures evaluated using objective, verifiable expectations for performance in radiation oncology. It must demonstrate its commitment to high standards of safety and quality in the practice of radiation oncology and that it practices patient-centered care by promoting effective communication, coordinating treatment, and engaging patients and their families as partners in care. APEx has a distinctive program structure that includes both a self-assessment process and a facility visit conducted by a medical physicist and a radiation oncologist, radiation therapist, nurse, dosimetrist, nurse practitioner, physician assistant or practice administrator. APEx integrates Maintenance of Certification (MOC) templates that promote value and efficiency for physicians and final evaluation reports that link standards and performance to quality improvement resources. APEx applicants also have access to a library of quality improvement practice management tools to facilitate a culture of safety. APEx reflects competencies and practices identified and endorsed in the 2012 ASTRO publication Safety is No Accident: A Framework for Quality Radiation Oncology and Care. The team at Sparta Cancer Center offers the most comprehensive, advanced radiation therapy technologies available in Sussex County, NJ. Doctors carefully advise patients with a cancer diagnosis about the therapies most effective for their type and stage of cancer, and educate them and family members on their treatment options. The Center accepts most insurances. Patients are also given the opportunity to participate in cancer clinical research trials. More information is provided at www.spartacancer.com. ASTRO is the premier radiation oncology society in the world, with more than 10,000 members who are physicians, nurses, biologists, physicists, radiation therapists, dosimetrists and other health care professionals who specialize in treating patients with radiation therapies. As the leading organization in radiation oncology, the Society is dedicated to improving patient care through professional education and training, support for clinical practice and health policy standards, advancement of science and research, and advocacy. ASTRO publishes three medical journals, International Journal of Radiation Oncology • Biology • Physics (www.redjournal.org), Practical Radiation Oncology (www.practicalradonc.org) and Advances in Radiation Oncology (www.advancesradonc.org); developed and maintains an extensive patient website, RT Answers (http://www.rtanswers.org); and created the Radiation Oncology Institute (www.roinstitute.org), a nonprofit foundation to support research and education efforts around the world that enhance and confirm the critical role of radiation therapy in improving cancer treatment. To learn more about ASTRO, visit www.astro.org. The Doctors, Nurses and Technologists at Sparta Cancer Center are always available to respond to your needs.